I have 2 hamsters named peaches and cream i love them both with all my heart they are spoiled littel fuzz butts they are soon to be getting new cages and many more toys. 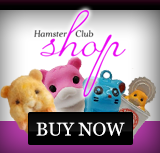 Just wanted to say that this is a brilliant site for helping to keep a hamster and understanding its behavior. 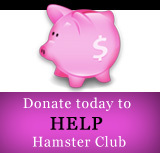 Its been really useful keep up the good work hamster club! I am unsure whether I am a member or not. I have bought your good hamster book.I have had 3 dwarf hamsters. Unfortunatly my hamster died today.i love him very much I was shock as I went to brush my teeth in the morning I saw him lying dead on the food bowl I was so scared and worried.decided to buried him downstairs my house.